Review: One of my friends introduced me to this LA band called “Dry September.” You can visit their MySpace page here and download their music for free. You can also buy the entire CD here. I love their music. Lead singer, David Tokaji, has a killer voice. The video below contains their original song, “Back to Birmingham.” There’s also a “One” cover video, but the audio is not as clear. 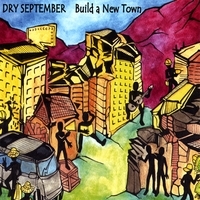 If you like the music, visit Dry September’s MySpace page (download the music for free) and email the link to your friends. Thanks! I love this singer. Ingrid Michaelson, who is more of a presence on MySpace, is really fantastic — I can’t believe a major label hasn’t signed her yet! What are they waiting for? Her music has been included in an Old Navy commercial and on Grey’s Anatomy. Her music sells, pretty well, on iTunes. She keeps 2/3 of the $.99 for each download, much more than she would get if under contract with a music label. You can listen to an NPR interview of Ingrid here. News: I will be making a more concerted effort (no pun intended) to feature talented amateur musicians. I’ve been doing this already (in my posts called uTunes), but I will try to make it a regular Monday feature (maybe every other week, if not weekly). To be honest, it’s been hard to find a steady crop of talented singers on YouTube after Terra Naomi and Esmee. I will keep trying, though. Analysis: So far, male amateur artists have not hit it as big from YouTube as the women. I like the tone of this guy’s voice. Very clear, and a catchy, lyrical tune. Two drama students in Singapore: Rebecca (“Bec,” her real name is Rebecca Louise Burch) and Rossalina (“Ross” for Rossalina Nasir). The best amateur duet I’ve heard so far on YouTube. They haven’t posted on YouTube in a while, but here are their videos. Their most popular song is this fantastic cover of Torn. UPDATE: The more I listen to this duo, the more amazing I think they are. Great voices, but they are controlled and never over-sing. Some label should sign them! (Where’s Justin Timberlake?) Here’s a moving rendition of Linger, sung with some friends before graduation, and a soft, sweet duet of Leaving on a Jet Plane. If you live in Singapore, you can see The Bec and Ross show weekly on Wednesday at a bar called “Hideout” at 31b Circular Road and other places. If you don’t live in Singapore, they say that they’ll be back posting on YouTube soon. One man band, John Vesely. uTunes: Is Gina Moffit the next YouTube idol? But you may not have heard of Gina Moffit. At least, not yet. You will. Here’s one of her original songs, “Waiting Game.” Even though her webcam was experiencing some audio problems (you’ll have to turn up the volume), you should be able to hear Gina’s sweet voice. The tone of her voice is so pleasant to listen to, but what I really love is the occasional edge to her voice. I’m not sure that’s the correct technical term, but you can hear it at 1:11, 1:05, :53, :32, :19, and :14 seconds left on the video. More of Gina’s videos are here. You are currently browsing the archives for the uTunes category.